Seven years of daily aspirin, warfarin, amlodipine, ACE inhibitors and other medications to help manage my aortic dissection have unfortunately given rise to another health challenge. My new health challenge probably would have been completely unavoidable if I had incorporated a few simple habits into my medication routine. 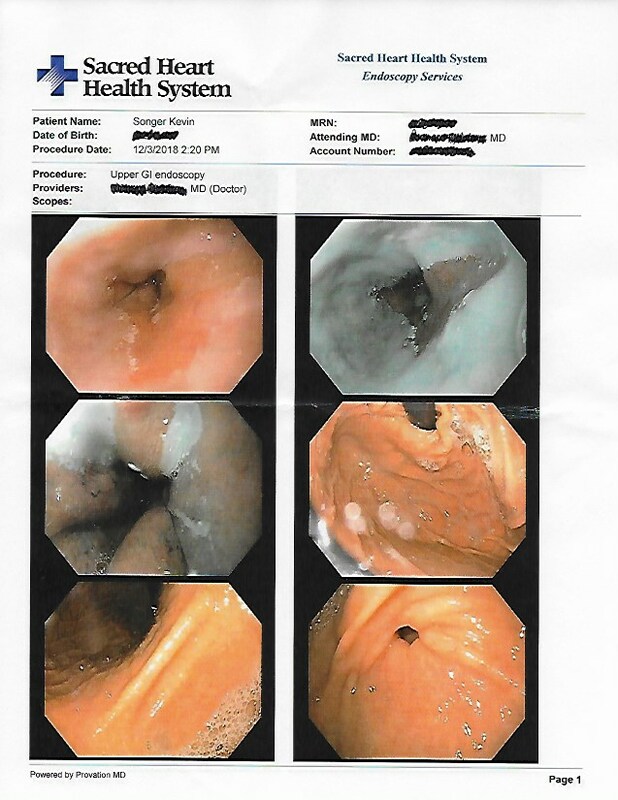 My endoscopy last week indicated I have severe esophageal erosion, more commonly referred to as Barrett's Esophagus. Barrett's may lead to esophageal cancer. Not all cases of Barrett's Esophagus will lead to cancer, however esophageal cancer is one of the most deadly forms of cancer known. Typically Barrett's Esophagus is caused by acid reflux. Risk factors may include obesity, smoking, drinking and acid reflux due to hiatal hernia. I do have a small hiatal hernia but have never experienced acid reflux. I don't smoke or drink and my BMI is on the low side of normal at 20-21. Connective tissue disorder issues (#Marfan Syndrome) may have contributed to the small amount of hiatal hernia yet my doctor seemed to think my Barrett's may have been caused by years of aspirin use, and more importantly, the way I took the aspirin and other meds. 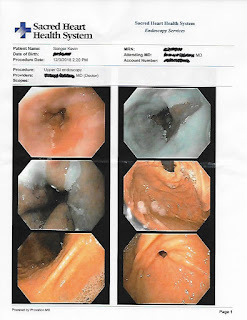 Interestingly my small intestines and stomach showed no dysplasia or significant issues. But my esophagus was inflamed, severely inflamed. The biopsies showed major changes to the esophageal cells but no cancer yet. I am now scheduled to have an endoscopy every two years to make sure that if Barrett's does progress into cancer, it will be caught early and hopefully in a treatable stage. The photo in the top right of the picture above is taken under a special light on the endoscope to highlight the area of Barrett's. Perhaps the changes to my esophagus could have been prevented if I had followed the procedures here for proper taking of medications. As I do now but did not do for the first seven years post dissection, I take a couple of sips of water first, before placing medications in my mouth. Those few sips help lubricate your esophageal lining and facilitate the capsules or tablets movement on their way down to the stomach. Once I take my meds I immediately drink a full 8 oz. glass of water. Before my recent Barrett's diagnosis however I'd pop my meds in mouth and take a sip of coffee to swallow them down. From time to time I'd even notice that they may not have all gone completely down and I'd take another sip. Importantly the stomach and small intestines can handle most medications. Our esophagus though is much less resilient. Interestingly, once the esophageal lining cells have been damaged, intestinal type goblet cells colonize the esophagus. These changes can be a precursor to adverse health conditions. Swallowing aspirin over seven years each morning with a sip of java, has eaten away at my throat. In fact, some days I'd even chew metoprolol and swallow without water hoping to slow down a really fast pulse even quicker. Barrett's is not always attributed to oral medication administration yet it can really help reduce risk simply by taking a few sips first then a glass of water after swallowing one's meds. Aspirin may not affect everyone the same way I believe it has me. But as of now I am off aspirin and taking my medications with plenty of water. As always discuss any changes to your life with your doctor before attempting them. Live and learn. #Dissection Life teaches me something new each day.